The Monster was one of the four mystery celebrity contestants who performed on “The Masked Singer” Season 1 episode 6 titled “Touchy Feely Clues,” which aired on Fox on February 6, 2019. She competed against the Bee, the Peacock and the Raven. During the solo performances, the Monster was the third to perform. He sang “American Woman” by Lenny Kravitz. Before singing Kravitz’s version of “American Woman” on “Touchy Feely Clues,” the Monster gave some clues to his identity. The masked singer said he has had his share of dark days. According to the Monster, he is a fighter who discovered the little Teddy bear he is at heart. He kept making sports references. A brief image of the controls of a music production studio was shown as a clue. He exhibited versatile vocals and great moves during his performance of “American Woman,” which impressed panelists Ken Jeong, Nicole Scherzinger, Robin Thicke and Jenny McCarthy. “That ain’t no athlete!” Jeong exclaimed. Later on, he guesses David Alan Grier and Tommy Davidson. McCarthy believed the Monster is an athlete while Scherzinger guesses Lil Rel. Thicke asked if anyone knew if Sugar Ray Leonard could sing and referred to the masked singer as a professional singer. 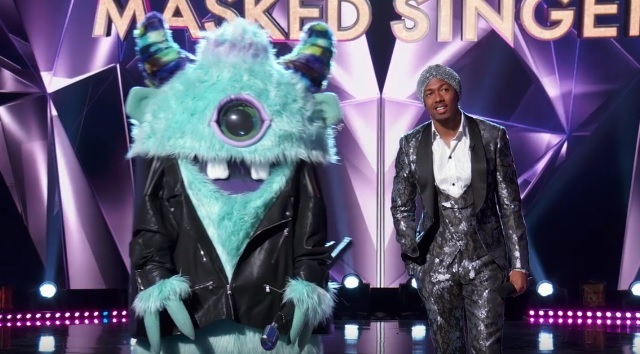 Host Nick Cannon said the Monster is somebody he knows based on the body language of the masked singer. The host added that the mystery celebrity contestant keeps on picking on him.